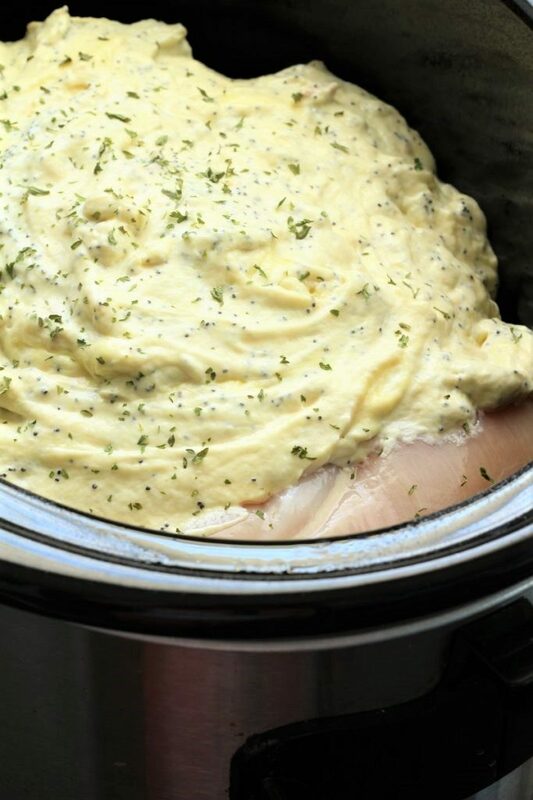 Crock pot poppy seed chicken is an easy crock pot meal that you will make over and over again. I love placing dinner in the crock pot and then forgetting about it. This frees up time that I can be doing other things, but I know that my family will be taken care of. 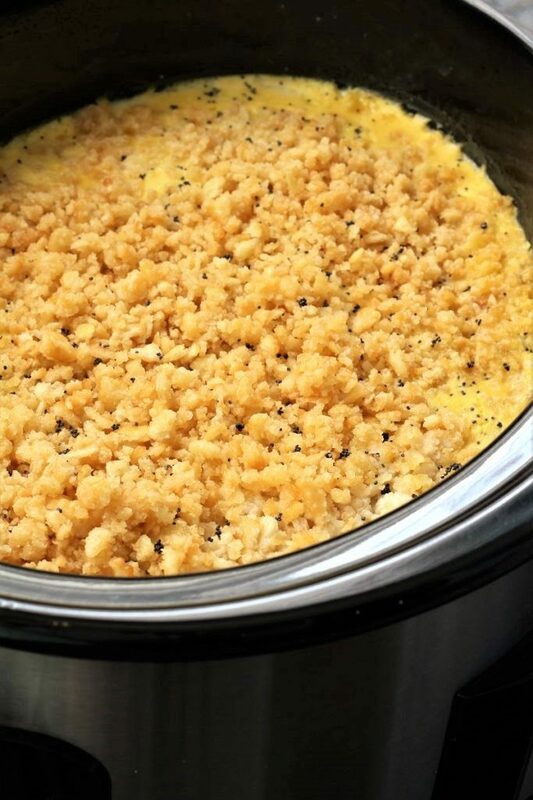 This is the first time that I made this crock pot poppy seed chicken in the crock pot. I have always just made this dish in the oven, but I really did like the way that it turned out in the crock pot. So this is a cute story. My grandson that is two came over today and I was tending him. We went for a walk because it was such an nice day. The weather was around 75 degrees and where I live, you better take advantage of that because it doesn’t seem to last very long. My son’s dog was wining because he wanted to get out too. The only problem was that he chewed through his leash the other day. So I told my grandson that Apollo had to stay home because he chewed his leash. I have a daughter named Alycia. My grandson said to me,” he chewed Alycia”. I told him no, a leash is something that you hold on to when you are taking a dog for a walk. He just couldn’t figure that out and he was so concerned for Alycia, so when we got back home, I showed him the leash. Not sure if he ever got it? Bless his heart! Another thing my sister asked him to bring her, her glass. It was right in front of him on the table. He tends to say “Huh”? So he said “huh and she said bring me my glass please and he just couldn’t seem to find it. I told her he is use to it being called a cup and so I asked him to bring her, her cup and he did. Then he looked at her face and said those your glasses. Ha ha. You know this English language can be very tricky sometimes and it makes me wonder how many times we all think that we are telling someone something and they are getting a total different story than we are telling. We would all do well to slow down and think of others more than ourselves and wish them well, because they might be wishing us the very best! 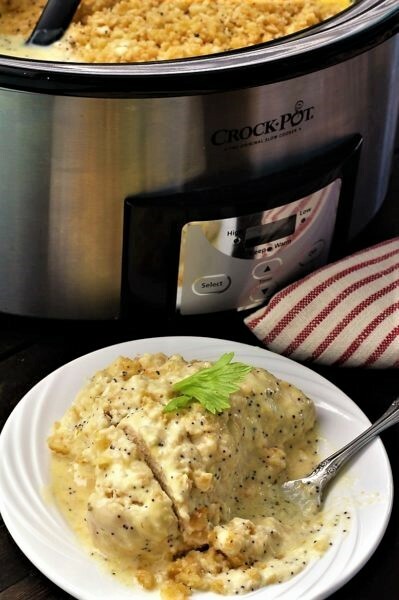 I wish you the very best day and that is why I am sharing this crock pot poppy seed chicken recipe. 1- You may want to cook this in a regular pan instead. 2- If you do cook it in a regular pan, you must boil or cook the chicken first. 3- Place it in a 9″ X 13″ baking dish. 4- Mix the sour cream, soups, and poppy seeds together, place over the chicken. 5- Crush the crackers and add to the butter. 6- Put the crackers over the soup mixture. 7- Bake covered in the oven for 30 minutes in a 350 degrees oven. Optional: Poppy Seeds for garnishing and serve over rice if you like! Spray the bottom of a crock pot. Place enough chicken breasts to cover the bottom of the crock pot. In a medium size bowl, combine the sour cream, soup, and the poppy seeds. Cook on high for 1 hour and then turn it to low and cook for an additional 2 - 3 hours or until the chicken reaches 160 degrees. The last ½ hour before serving, crush the crackers and add to the butter that has been melted. Sprinkle on top of the chicken and soup. Optional: Garnish with poppy seeds and serve over rice. That is what I have decided. I have never used my crockpot as much as I have this summer. I have decided that I love using my crockpot summer and winter. I keep trying to come up with more crockpot recipes! I hope that you enjoy the poppy seed chicken as much as we did. I agree,with you the crock pot is an amazing invention! I need to start helping my son that just moved out with some simple recipes so when he gets home from work dinner will be ready for him! This looks delicious. I have never had poppy seed chicken but it looks and sounds fabulous! This looks like a great new chicken recipe for fall!!! Thanks for sharing on Friday Frenzy! It looks super yummy. Thanks for sharing such a nice and simple recipe.